"Can I get a little butter on this?" 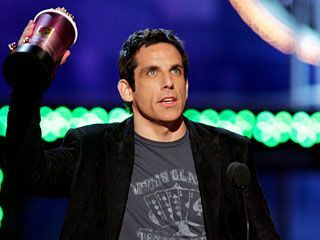 Ben Stiller wins one as Best Villain. Hilary proves she's Duff enough to present. Breakfast Club 2005--but where's Bender? Future Mrs. Cruise? Katie Holmes presents at the podium. 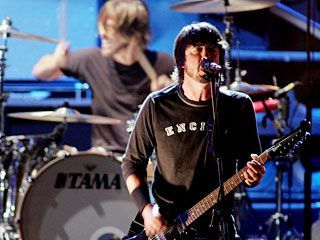 Mariah to Movie Awards: "We Belong Together"
Foo Fighters bring their "Best" to the stage. 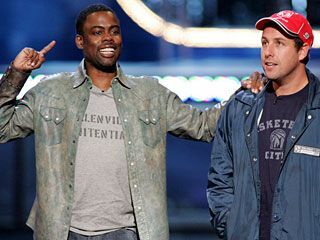 Wanted: Chris Rock and Adam Sandler--for being hilarious! Rachel McAdams: nothing "Mean" about this girl. 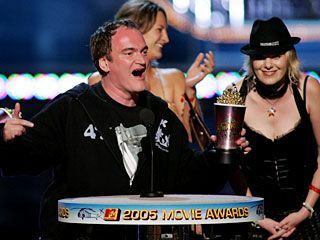 Another low-key acceptance speech from Quentin Tarantino. 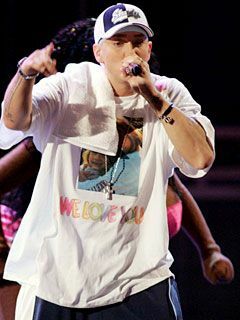 Eminem performs (puppet posse not pictured). The Duke boys and Daisy get ready to present. Vin Diesel and Jennifer Connelly dish out the next popcorn award. Jimmy Fallon to Sandra Bullock: It's alway good when the host's got your back. Guess who's playing The Thing? 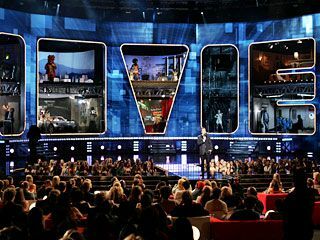 Ioan Gruffudd, Jessica Alba, Chris Evans, and Michael Chiklis present. 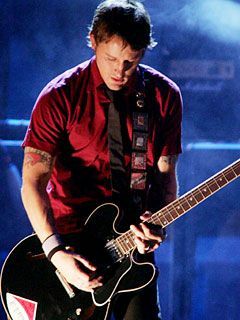 Foo Fighters give us one to Grohl on. 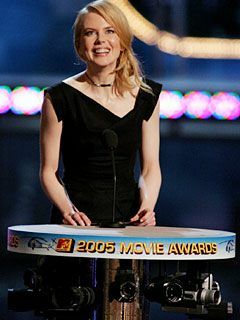 And that, my friends, is what you call a million-dollar smile--Nicole Kidman on stage. 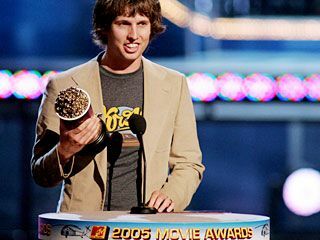 Napoleon victorious: Jon Heder grabs one of three popcorn awards for Napoleon Dynamite. I think they know each other--Katie Holmes gives Tom Cruise a bear hug. Lindsay Lohan: Sometimes you gotta give back to the fans. America chooses Cruise! 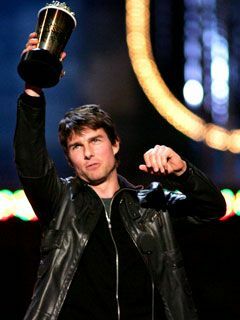 Tom gives props to the crowd. Rachel McAdams, Lacey Chabert, Amanda Seyfried and Lindsay Lohan win Best On-Screen Team. Great, now they'll be even more clique-y. 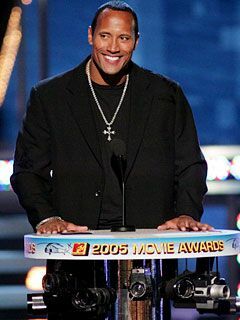 The Rock gets ready to pass the popcorn. Where's the host? 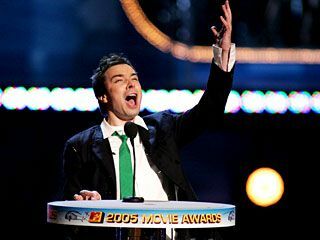 Jimmy is camouflaged on the massive stage. Dakota Fanning rides in on Cruise Control. 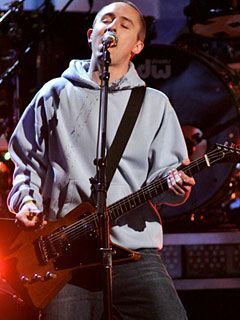 MTV Movie Awards: Best soundtrack in the biz, with Yellowcard performing. 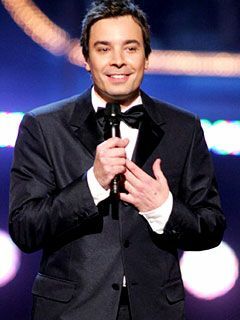 Jimmy announces his candidacy for Mayor of Sillytown.